Our civilisation process is accompanied and defined by our attitude towards, and our handling of, the material of stone. Since prehistoric times stones have been harvested, shaped and used in various ways - first as tools for survival and hunting, later evolving into tokens, amulets, artefacts, and the most durable construction material. 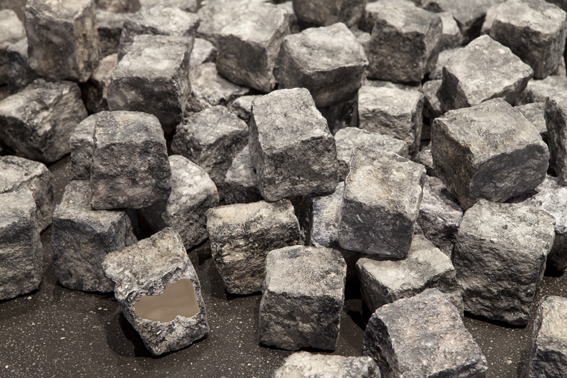 Stone is the basis for both vertical and horizontal building and a constitutive element of streets and roads that connect places, directions and actions. The paradox of stone's durability and stability is that it "paves the way" for transformation and builds sites where - and through which - change takes place. From the time of Enlightenment, when the street became a site of political mass action, a "place for the collective", the stone regained popularity as a weapon and a survival tool. It returned to its ancient uses as a handy projectile (missiles of the weak), a building material for defence and fortification (barricades), a trap (destroying the streets in order to disable the mobility of controlling forces). The street turned into an alternative to the politics taking place in a secured privacy, behind closed doors. 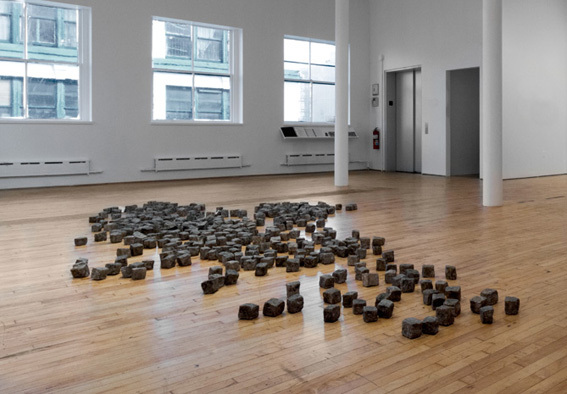 The cobblestone not only defines the arena of protest but also acquires its own political agency: it evolves from a mere utilitarian material to an actor of change. Clash! 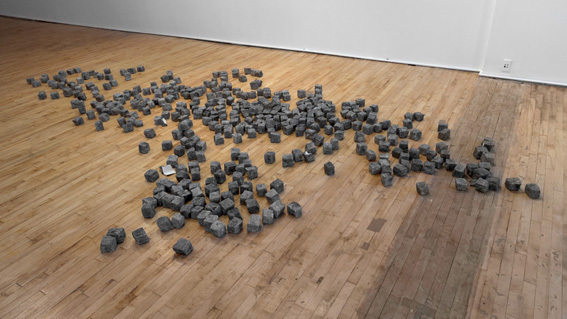 takes the form of an installation that looks like one of those piles of paving stones usually found on construction sites and streets. 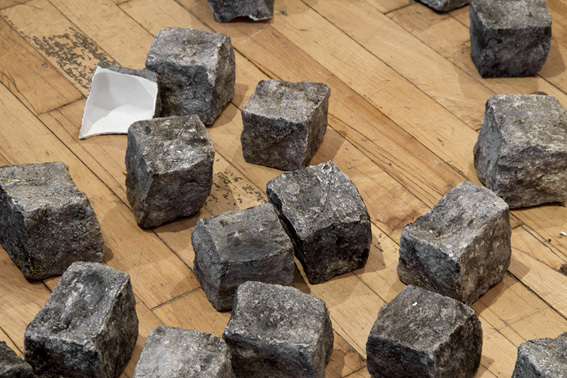 Referencing cobblestones that are often used by street protesters with the intention of combat, the stones' potential role as impromptu weapons is here transformed by the use of material they are made of. Manufactured over a long time in cold casting porcelain, and hand-painted with acrylic paint to produce a veristic appearance of real stones, these objects are in fact very light and thin, eggshell-like and hollow inside. 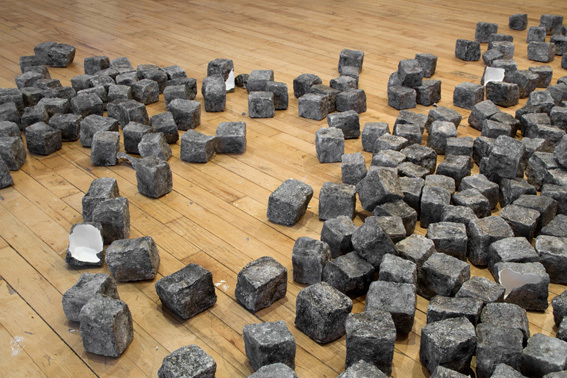 Through the meticulous process of artisanal production, these hand-made "stones" become precious and vulnerable objects that are uncanny and prop-like. Yet, instead of creating mere objects for retinal journey and a visual trap, we intended to zoom in on their corporeity, to direct the attention back to the "flesh of the world", to induce a tactual scrutiny and a sense of materiality and empathy. 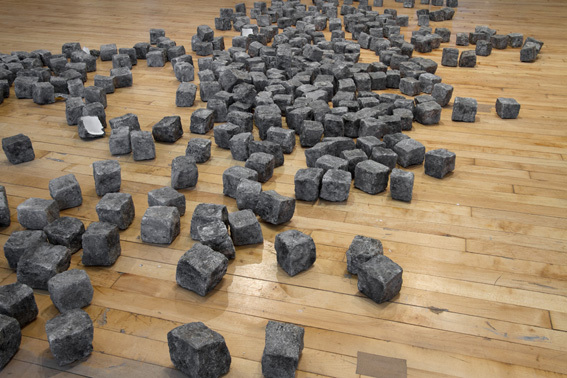 Visitors in the gallery are allowed to touch them, hence the "stones" are open to closer examination, to a palpable second look, in order to impart their texture, weight, temperature - their "skin" and their nature.